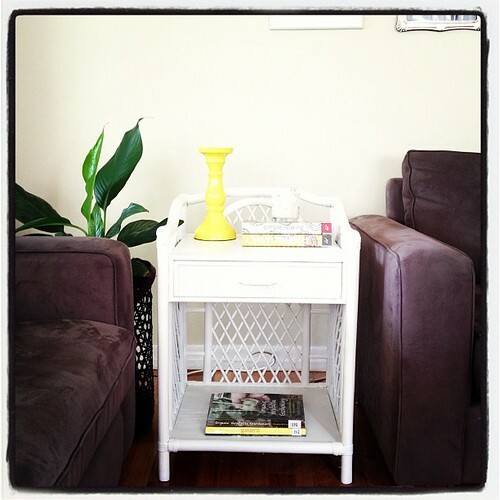 I've developed a thing for white cane furniture. Surrounded by lush indoor foliage, some black and white and a dash of blue or yellow, it looks so tropical. 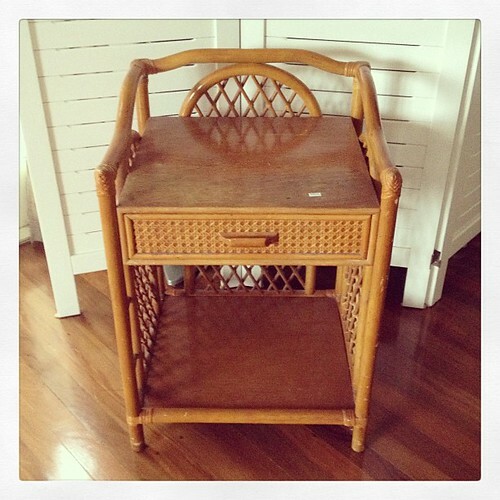 I have had the good fortune of scoring a few cane pieces from op shops, so I thought I would share with you the process I took to redo a little side table. I gave it a good clean up, using a brush to get all the dust off and then gave it a good clean in with some sugar soap. Because the cane was lacquered and I had zero desire to sand it, I prepped with my old friend Zinsser. 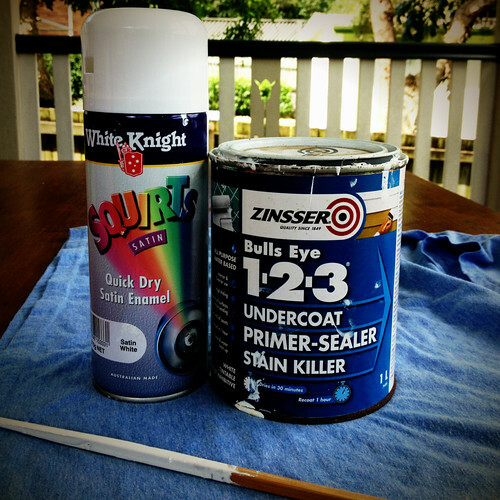 Apparently you can get Zinsser primer in a spray can, but I have yet to find it at the hardware store. I used a soft, round furniture painting brush to apply a light coat all over. Fiddly. I purchased 3 cans of White Knight Quick Dry Satin Enamel in, well, White. I was a little worried because we know that there are whites and there are whites, you know. Happy to say this is a nice, fresh, soft white and the Satin was the perfect low sheen cover that I was looking for. I grabbed a few big boxes from the pile at Bunnings and used this to surround the table and minimise painting my lawn. Contrary to poplular opinion, I do not paint EVERYTHING white. Two coats, an hour apart and it was done. I left it for 24 hrs to fully harden before bringing it upstairs to find it a home/styling it/spill my coffee on it. I have another table in the pipe line and am currently stalking a few on Ebay. Next project to tackle is a big old dark brown bookcase that I am sure really, really wants to be white too. For that one I am going to overcome my fear of power tools and use my dad's spray paint compressor thingy...yes, I know all the right words. I think upcycling is the way forward and you've done a sterling job with that find. Looks great. Spray paint makes a fiddly job like this so much easier. Awesome job Tracey, I love it and you have styled it beautifully. Hi just stumbled upon your lovely blog. Great revamp. I hav a similar table on my to do list. Were you happy with the spray paint? 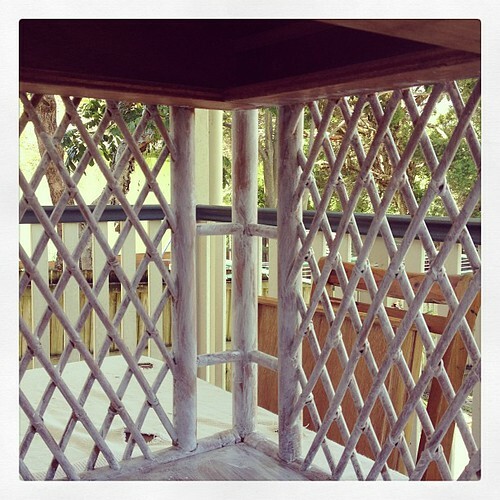 I haven't used it enforce but it looks like the easiest option with the lattice. Thanks for sharing. 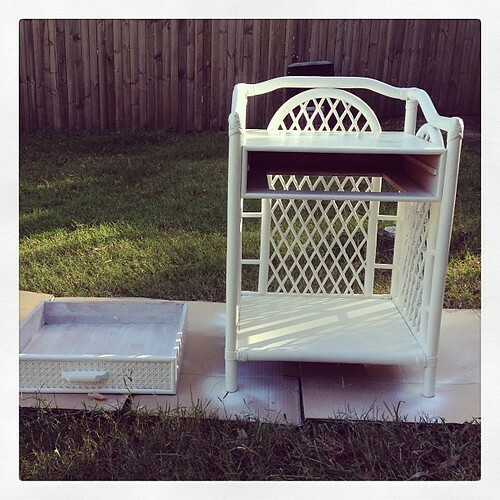 I love the white, and with your help I'll hopefully do something similar to my old cane table.